So the general elauction is in full swing. And the theme of GE2016 is “Irish taxpayers are uniquely, punitively, outrageously taxed, and thats causing all our trouble:. Pretty much every party, bar the courageous (in a Sir Humphrey Appleby way) Social Democrats are pledging to cut, slash, reduce…. First, the total : the tax wedge, defined as the difference between total costs to the employer (so including PRSI and other social security) vs what the employee gets (so including USC and PRSI). Oh, look…. 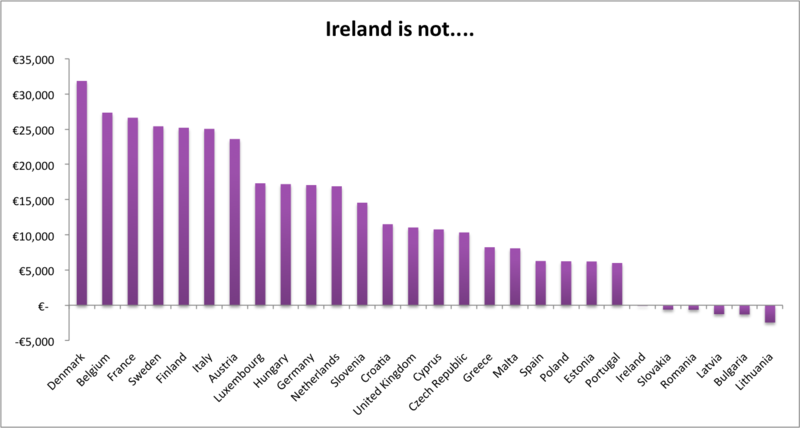 Then tax on the average wage (a shade under €700 per week for 2014 from CSO data) by family type. Cash transfers here are the standard benefit packages such as childrens allowance or its equivalent. Finally at different percentages of the average wage. Ireland is in red. Feeling overtaxed is fine. Claiming that we are, at least in the comparative sense, is not. Its not just a misreading, its a misrepresentation. We get the politicians we elect. If we elect people who look us in the eye and lie a hole in a pot, so be it. This entry was posted in Blogpost and tagged elections, ireland, lies, memes, myths, personal taxes, tax wedge, taxes on January 31, 2016 by brianmlucey.